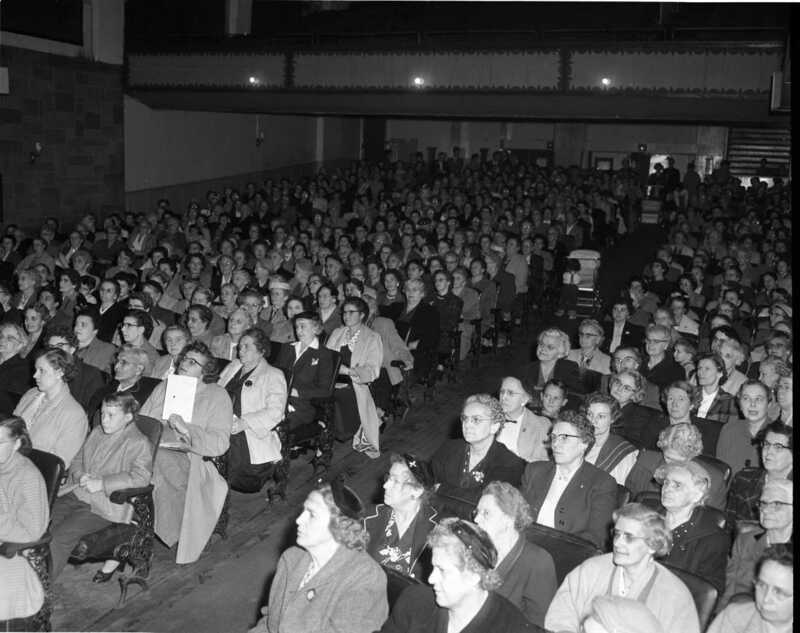 Apple Day headquarters 1956 is a room in Knox Presbyterian Church. 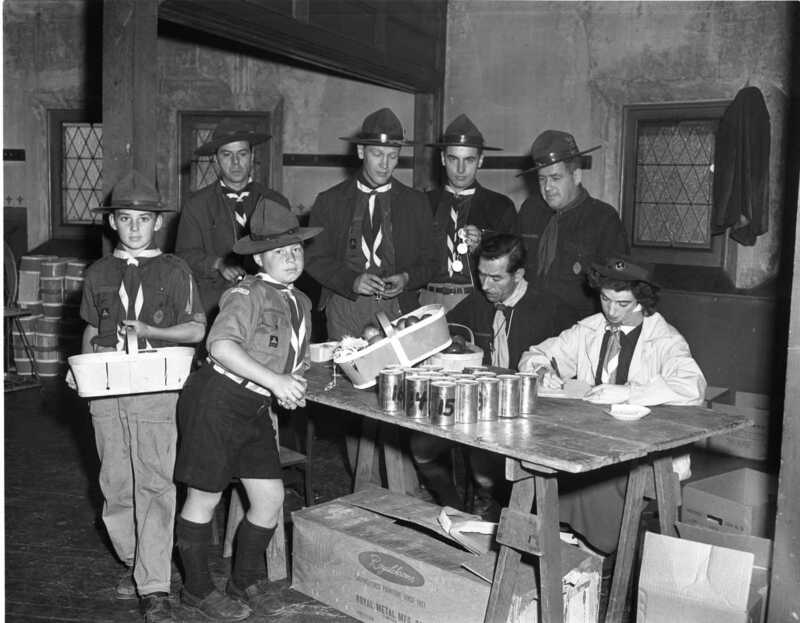 Scouts Gary Blake and Jerry Berriault receive their apples and money cans from Assistant District Commissioner Harvey Boyd and Cubmaster Ida Gardiner. 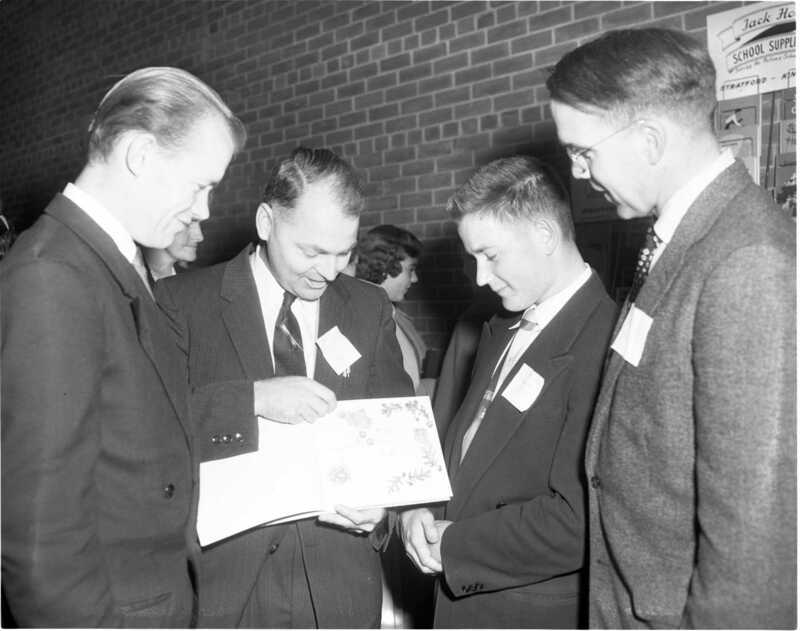 In the back row are Cubmaster Wilf Hamelin, Scoutmaster Tom Gilbert, Assistant Cubmaster Art Richards and District Scoutmaster Charles Roberts look on. Saturday was Apple Day for Cubs and Scouts all over Ontario. 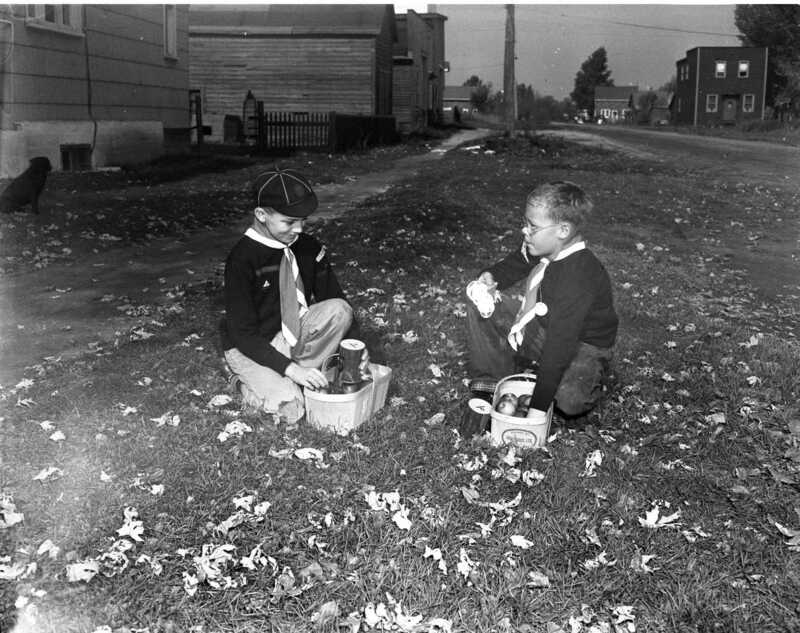 Billy Cameron and Billy Graham tidy up their baskets before continuing their rounds of Port McNicoll homes. They are members of the 1st Port McNicoll pack. Yeggs’ strike local IGA store. 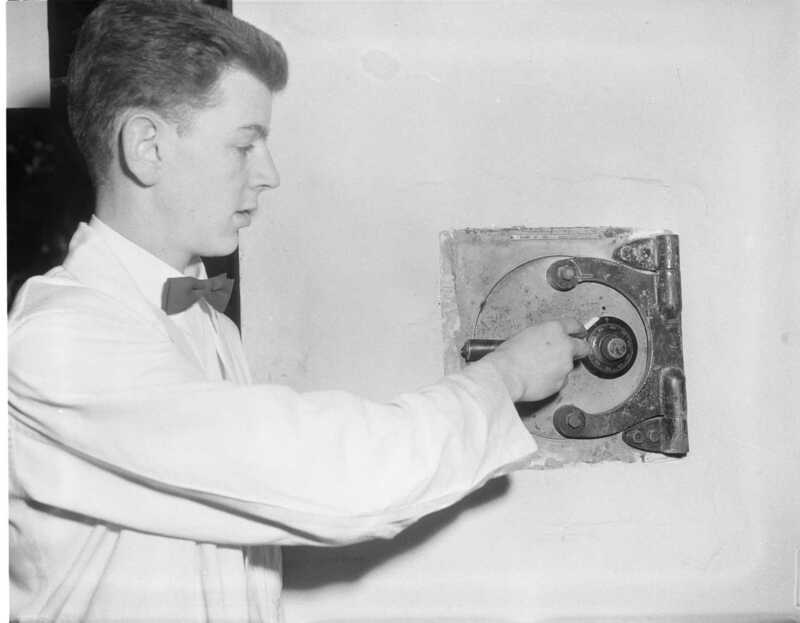 Manager George MacFarlane points to the tiny hole drilled into the store safe in an unsuccessful attempt to open it. The safe was embedded in concrete at the front of the store. Two display stands had been moved to conceal their activities. Stealing is hard work and the would-be thieves had to take a break, consuming two pops and a large chocolate bar. Midland’s new municipal building is taking shape on the old Central School grounds between Second & Third Streets on Dominion Ave. Late in arriving, steel for the new building has been erected this week , which will permit other work to proceed. 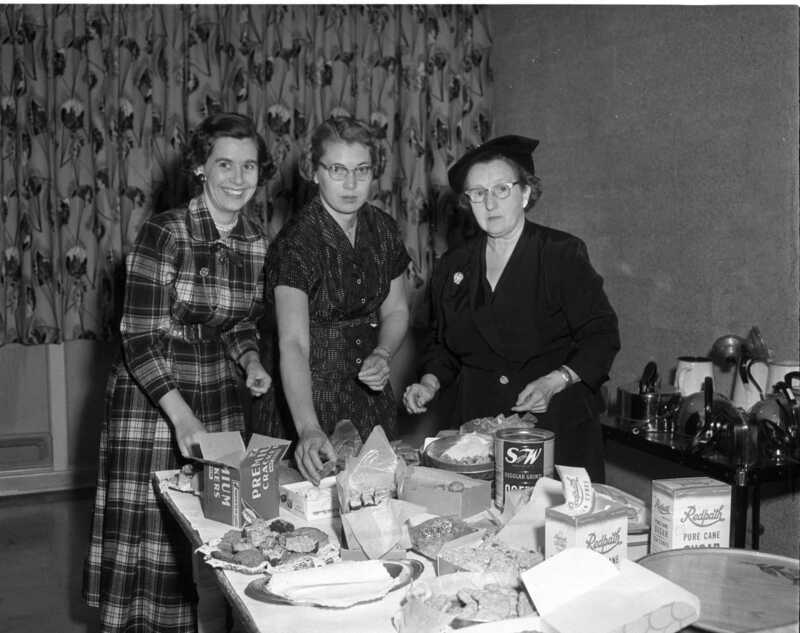 Getting ready to feed the hundreds of guests expected at the opening of the new public school in Coldwater are members of the Home and School Association, Mrs. Mervin Abott, Mrs. Clem Swailes and Mrs. James Emslie, convener of the group. This new addition, on the left, to the Waverly United Church was dedicated at services Sunday afternoon. Termed a Christian Education and fellowship room, it will also serve as a general auditorium. Many members of the congregation provided volunteer labour on the addition which cost around $8,000.00. Well equipped kitchen is included in the new addition to the Waverly United Church which will be dedicated Sunday afternoon. 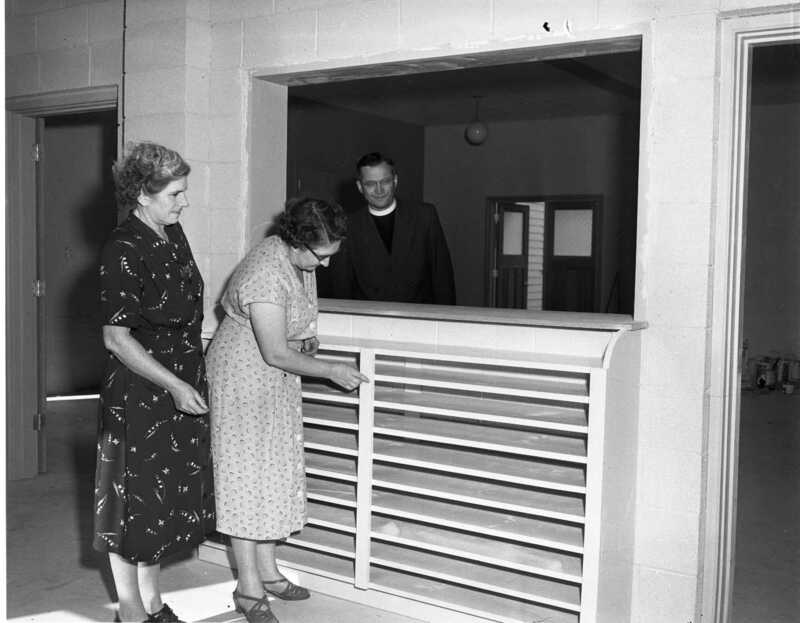 Mrs. Elmer French and Mrs. Reg Drinkill examine a storage rack under the serving window which will hold more than 65 pies. First customer at the counter is Rev. Wesley Glazer. 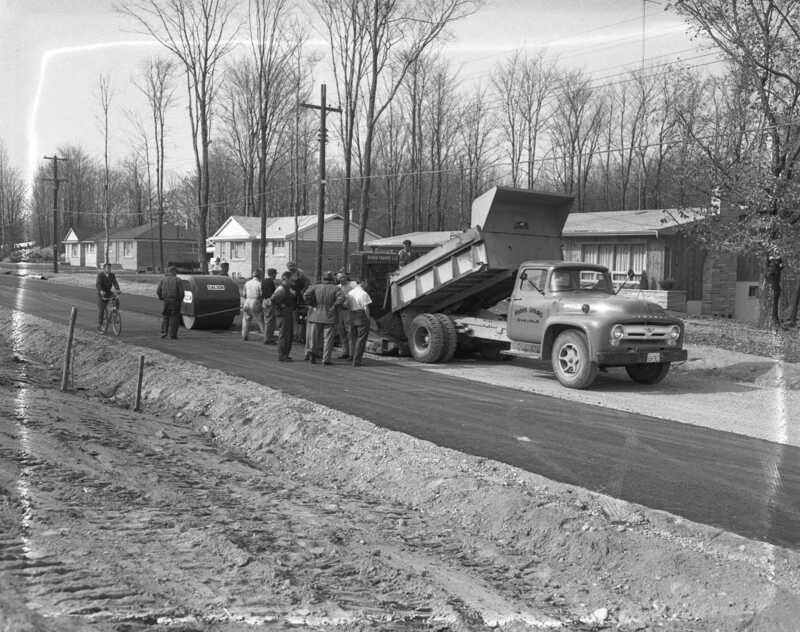 Homeowners in the new Ingram Subdivision of Tay Township were all smiles Saturday as workmen completed the first layer of pavement for the new street, a continuation of Hugel Ave. The street is now more than two miles long and runs from William Street in Midland’s east end to Highway 27 in the west. 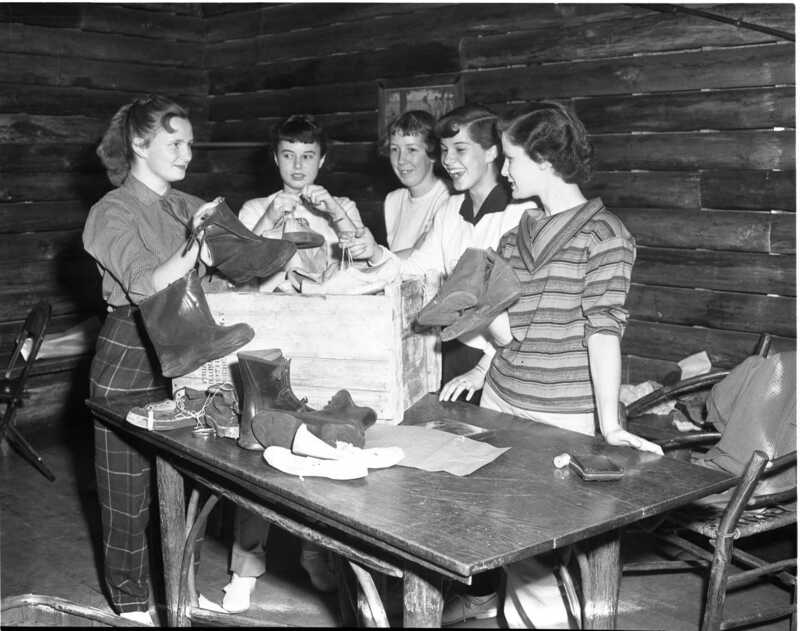 The girls, members of the Tironae Club of Midland YMCA, are sorting rubber footwear for cleaning and repairing before sending it to the Salvation Army. Elsewhere in the room another group is sorting clothing for the same destination. Carol Fox, Karen Robinson, Mary Ann Nicholson, Sheila Barber and Shirley Ann Silver. The young lads are getting a few pointers on how to build up muscles through exercises on the parellel bars. 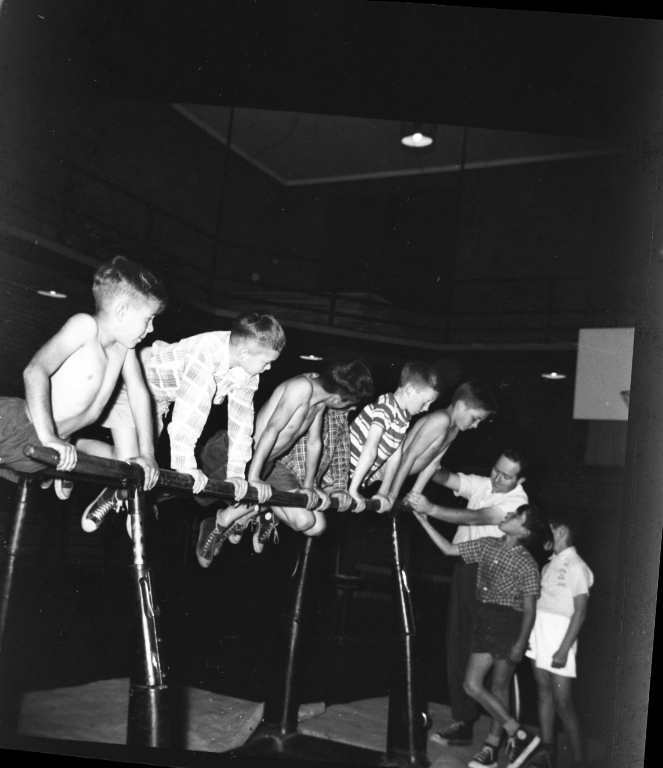 They are one of the many groups who receive weekly instructions on gymnastics at the Midland YMCA. Boys are David Carpenter, Ronnie Gosselin, John Thomas, Randy Jones, Paul Henderson, Jerry Beteau, instructor Alex Owen, Edo Wensveen and Gerald Karch. There were seldom any empty seats during the five days that Loblaws held their cooking school in the Capitol Theatre, King Street, Midland, last week. 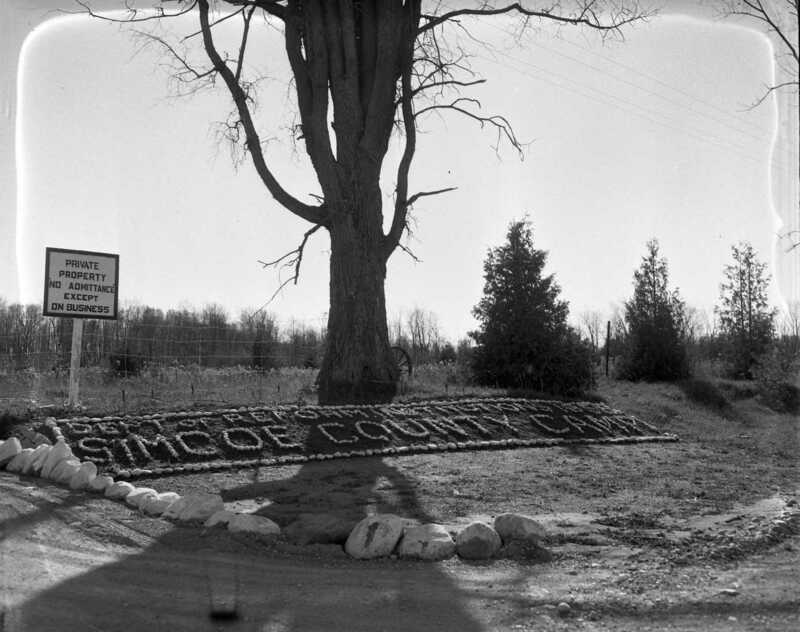 In a rustic setting, these white washed stones direct the visitor to the Simcoe County Camp of the Ontario Department of Reform Institutions near Hillsdale. In spite of the open gateway there were no escapes attempted this summer at the experimental project where 50 prisoners worked under a few unarmed guards. 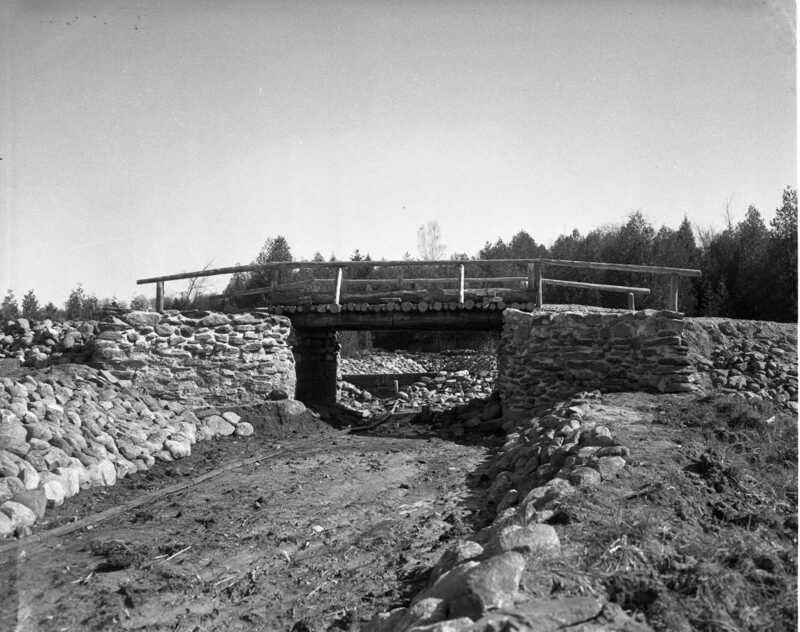 This sturdy bridge on the conservation farm was built by prisoners in nine days at a cost of about $15.00. With the extensive rockery lining the stream, dammed up when the photo was taken, it will add much to the scenic beauty of the Kiwanis property. 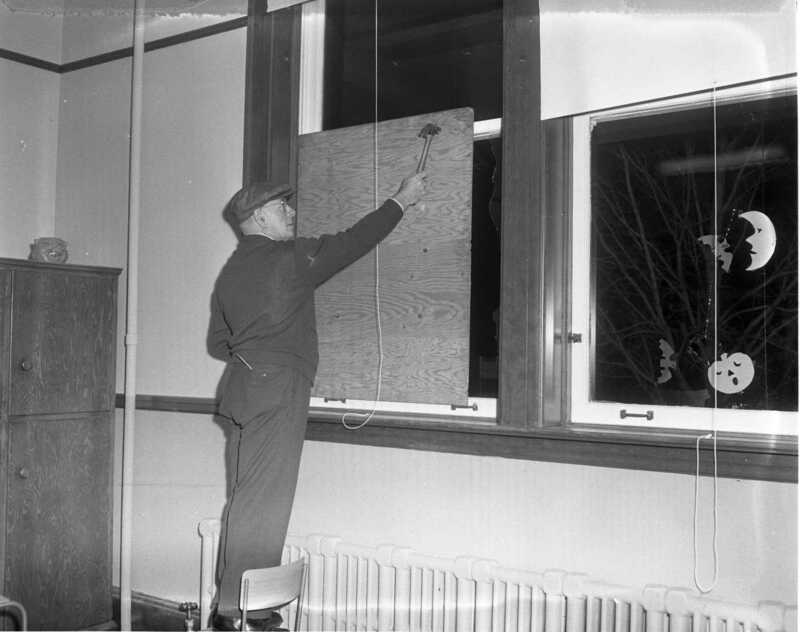 Caretaker at Parkview School, Len Wiles, boards up another broken window, part of a long string of senseless vandalism occurring in Midland recently. Window to the right has a hole in it as well, just to the left of the pumpkin. Good progress is being made on Midland’s newest industrial building, that of Pinecrest Products Limited. Located at the extreme easterly end of Bay Street, the new factory will produce unfinished furniture. 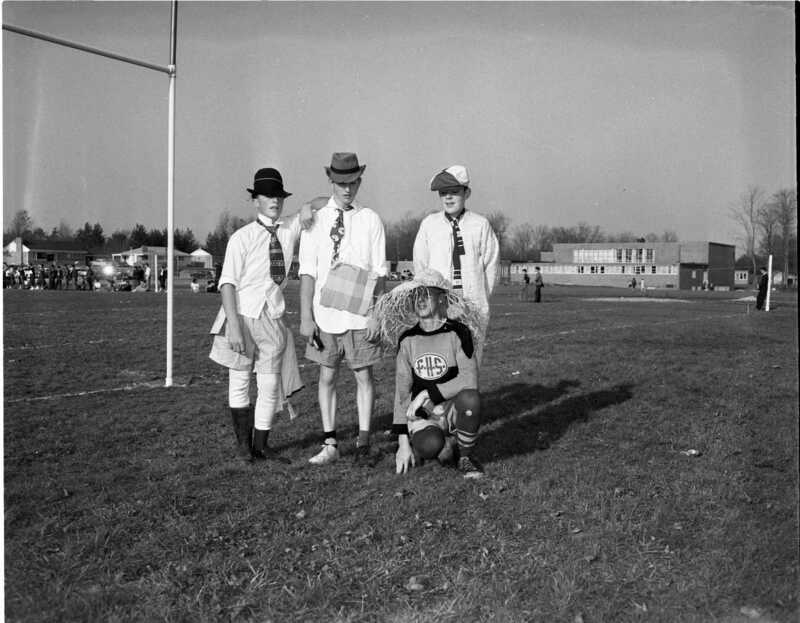 Dressed for initiation these four students are attending the Collingwood vs. Midland junior football game last week. Members of the HiY Unamotus Club the boys are; Ernie Somers, Ron Parker, Gary Woods and kneeling, Bill Swann. Simcoe District teachers inspect a new text book during a meeting at Regent School, Midland. Henry Bergen of Christian Island; Ken Cowan, Midland; Wesley Anderson and Walter Black of Christian Island. Barbershoppers are featured in this week’s “Pot Luck” in the editorial column of Wednesdays paper. 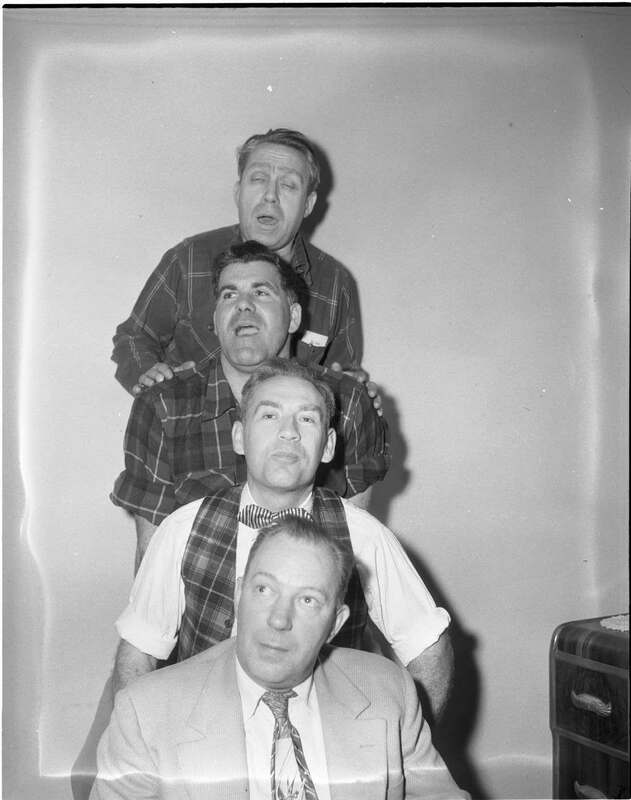 Bottom, Glen Campbell, Ray Trew, Lloyd Atkinson and Archie Campbell. 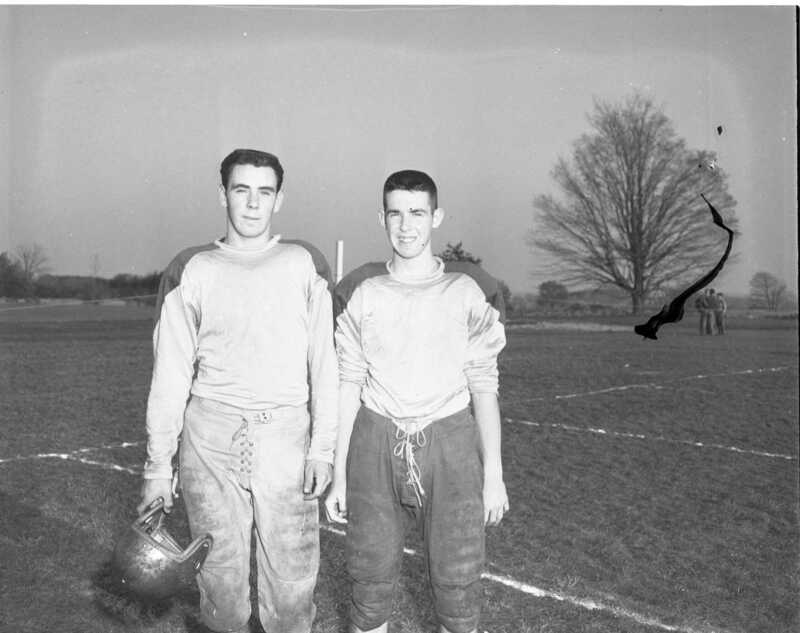 MPDHS almost beats Collingwood junior football team, lose 22-16 despite Larry Leroux on the left catching three touchdown passes thrown by John Dubeau on the right. Keri Beteau pulls the winning ticket at the recent cooking school sponsored by Loblaws and H. J. Thompson and Sons Ltd. at Midland’s Capitol Theatre. The winner of a new stove supplied by Thompsons was Mrs. Charles Robb of RR 2 Penetang. 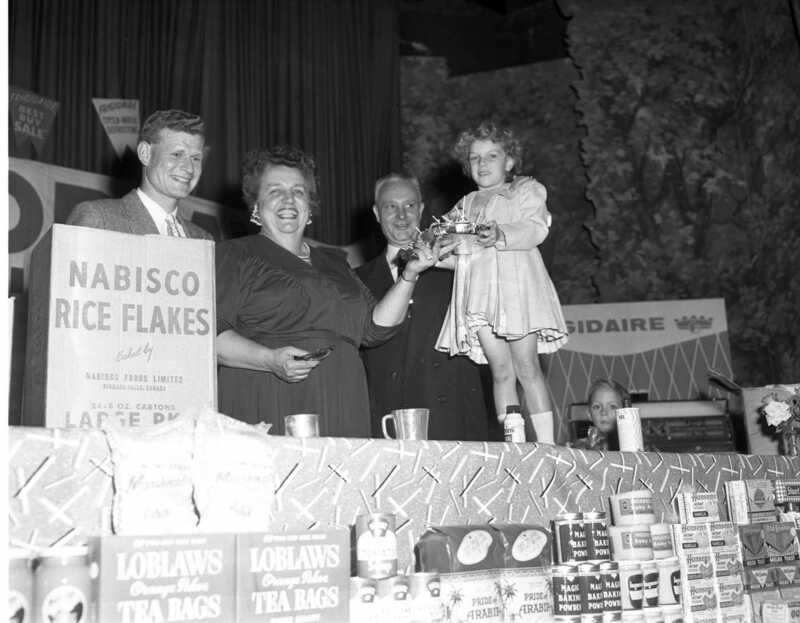 With Keri on stage are sponsor Bill Thompson, Mrs. Elsie Clay Rogers, who conducted the school and E. G. Saigle, a promotion official with Loblaws. 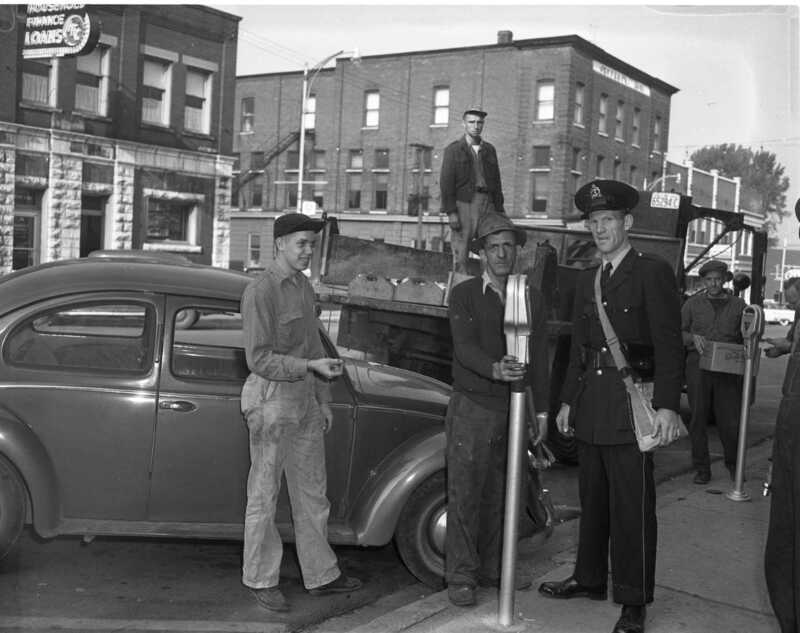 October 17th was a happy day for downtown shoppers in Midland as the public works staff began the job of removing and storing all of the parking meters until spring. 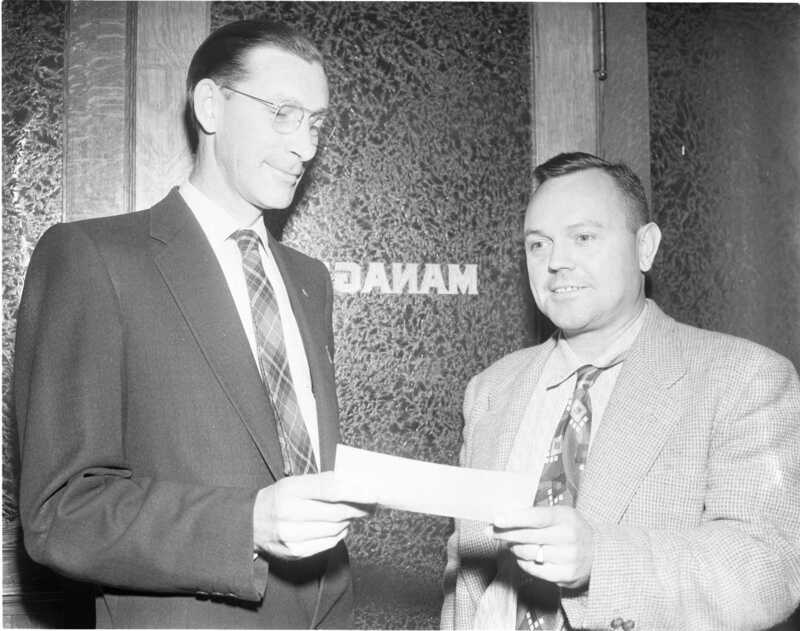 Ken Walker, left, smiles as Constable Tom Currie tells him to put his money away. 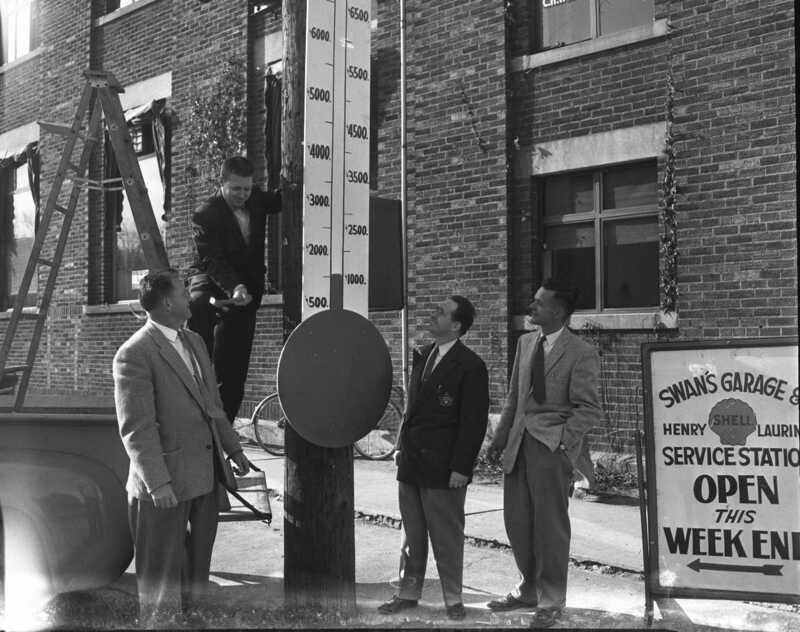 Removing the meter is Sam Butineau. St. Andrew’s Hospital board member H. G. W. Paice, left, receives a cheque for $1,000.00 from Lions Club president Bill Jeffery. Midland’s newest nonagenarian is Philip Henry Blake who marked his 90th birthday at his Yonge Street home Saturday. 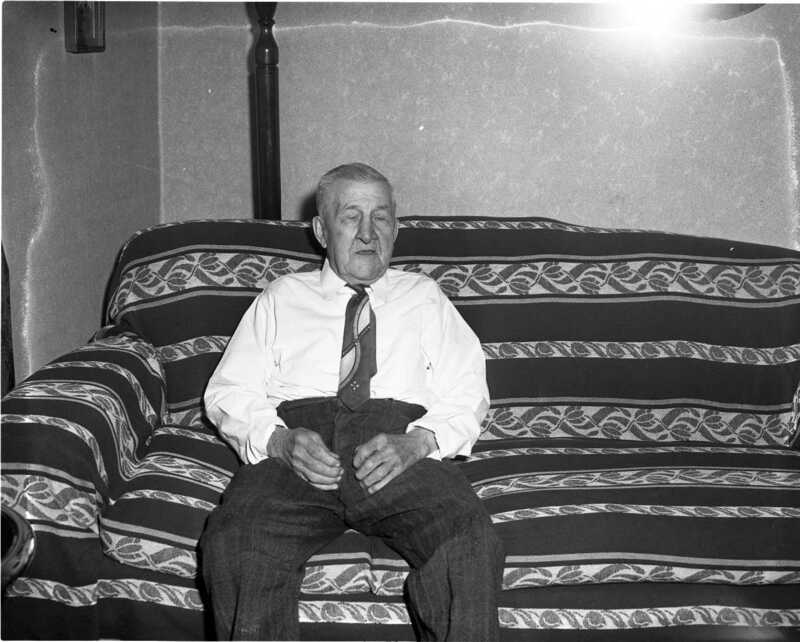 A native of Ottawa, Mr. Blake has been a resident of Midland for 51 years, most of which time he was engaged as a lumber inspector. People from all walks of life attend the funeral services at St. Paul’s United Church for A. D. Tushingham, recently curator of Huronia Museum and retired manager of the Bell Telephone Company in Midland. Mr. Tushingham died of a heart attack while on a motor trip with his wife and daughter to the east coast, he was 73. No trouble cleaning this fish as the owner is a butcher by trade. Isadore Arbour of 242 King (now 264) caught this 12 pound, 36 inch Northern Pike off the Tiffin Elevator last week with a Canadian Wiggler. Guy Hebner and Clarence Cowie were in the party. 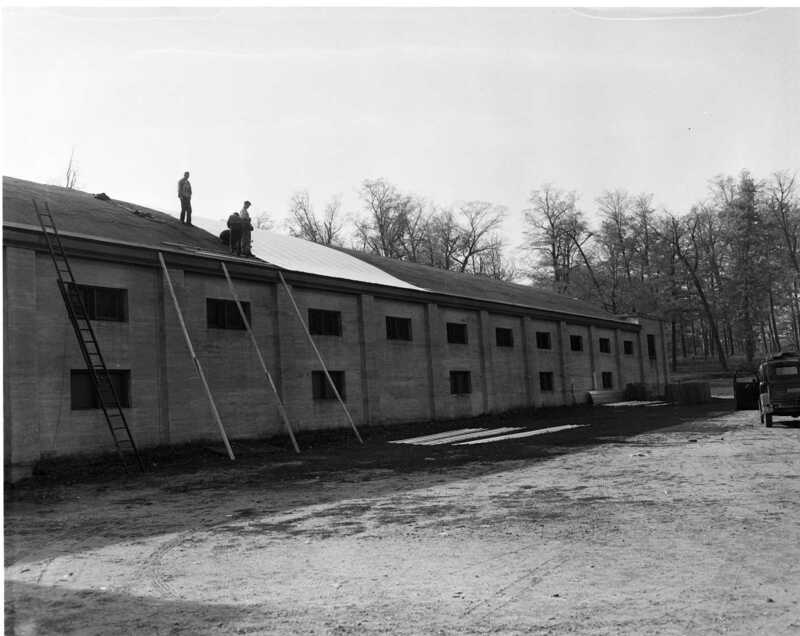 Workmen applying a new “all metal” roof to the Midland Arena Gardens. Msgr. Castex throws the first ball to open Penetang’s new bowling lanes. Grew Boats receives an order for two, 50 foot RCMP patrol boats. Manager Andy Morrison feels that extra staff will need to be hired and full staff will be needed all winter to supply current orders. The new patrol boats feature twin 350HP gasoline engines and sleeping quarters for the crews. Consumers Gas Company seeks a franchise from Midland Council to provide natural gas to the community. 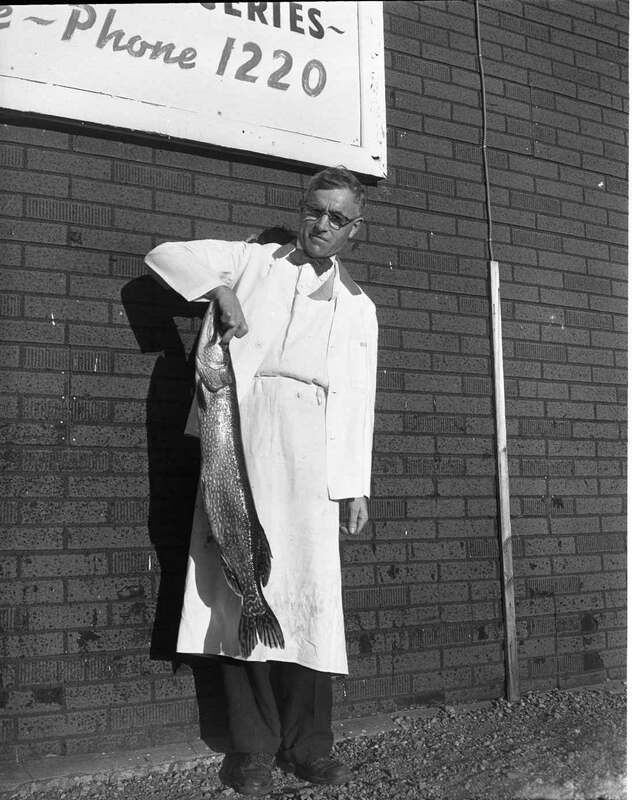 Supply will be available as soon as the Trans-Canada pipeline from Alberta passes east of here, sometime in the spring of 1958. The company is supplying American natural gas from Toronto as far north as Richmond Hill. Two towns plan joint interlocking schedules and administration for the coming Little Hockey League this winter. It is expected that 400 boys will take part in the Penetang league sponsored by the Penetang Boys Club and 450 to 500 in the Midland League sponsored by the Lions Club. Penetang will play in the Arena Gardens until the natural ice is available in Penetang. 1st Battalion The Canadian Guards will be holding a recruitment drive at the Midland Armouries, Thursday October 25th. Injured recently when his overalls became entangled in the shaft of a wood cutting machine, Robert Mosely Jr. awoke Thursday morning to the sound of tractors in his farm yard. By nightfall all of his fall plowing had been finished. While his neighbours worked Mr. Mosley remained in the fields on his crutches and his wife prepared lunch for the men. Resident of Penetang for 51 years, death came unexpectedly to Prosper Beausoliel on Saturday, October 20th at his Robert Street home. Born in Lafontaine he moved to Penetang in 1905 and has been a funeral director for the past 32 years. Sixty students, largest class ever, have enrolled in the Midland Business College. John Henry Reynolds of Penetang marks his 90th birthday, he has been a resident for 74 years. “Everywhere I worked you never got holidays, six days a week, often twelve hours a day, I guess I will take them now that I am retired.” His daughter-in-law with whom he lives says he is up every morning at five and until two years ago cut and split nine cords of hardwood every year for the furnace. The new James Playfair wing of St. Andrew’s Hospital will be officially opened by his brother Stewart Playfair of Toronto on Wednesday evening. Attendance at “Kitchi” hits a 37 year record. Father of three small children, Clarence Cousineau 28, of Honey Harbour, died in St. Andrew’s Hospital early Sunday morning from a gunshot wound received in a hunting accident 15 miles north of Honey Harbour about 4 p.m. Saturday. 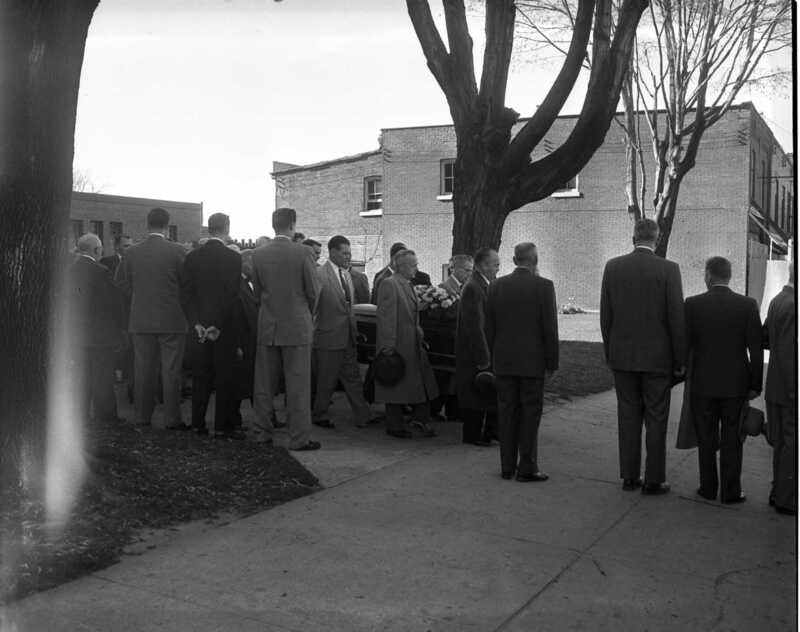 Mr. Cousineau was sleeping in the front of a fifteen foot boat when the shotgun of one of his two companions discharged. Party of ten ready for deer hunt. Ten members of the Midland Hunt Club will leave this week for their camp at Eagle’s Nest bay on the French River. Madore Latour, Gerrard Berriault, Elmer Contois, Peter Clause, Rex Downer, Charlie Scott, Stan Brooks, Gerry Gammon, Bill Johnson and Stan Sturgeon. Rumour is that a group is planning to petition the town to take a vote on a brewer’s warehouse and liquor store in Midland. Midland has been dry since January 7, 1907. An attempt to repeal the by-law during a municipal election in 1915 was unsuccessful. In order to force a vote the signatures of 25% of eligible electors is needed, that would be 1,155 names. Believed to be the town’s oldest native citizen, Mrs. S. A. Jelly recalls early days, written by Ken Somers, Free Press, Wednesday, October 24th, 1956. “Although she makes no claims to the fact, perhaps the oldest native resident of Midland is Mrs. Simon A. Jelly of 306 Fourth Street (now 352 just off Yonge). Daughter of the late Mr. & Mrs. H. S. Ruby, who themselves were among the earliest residents of Midland, Mrs. Jelly was born here 78 years ago, August 30th, 1878. Three years earlier her father, one of Midland’s first bakers, had moved his family to Midland from Barrie. The Ruby’s had eight children, all of them girls but one. Mrs. Jelly is the last survivor of that big family. Born Mabel Louisa Ruby in the home that adjoined her father’s bake shop on Midland Ave., she started her schooling in the old Manly Street School, the only one in the town at that time. 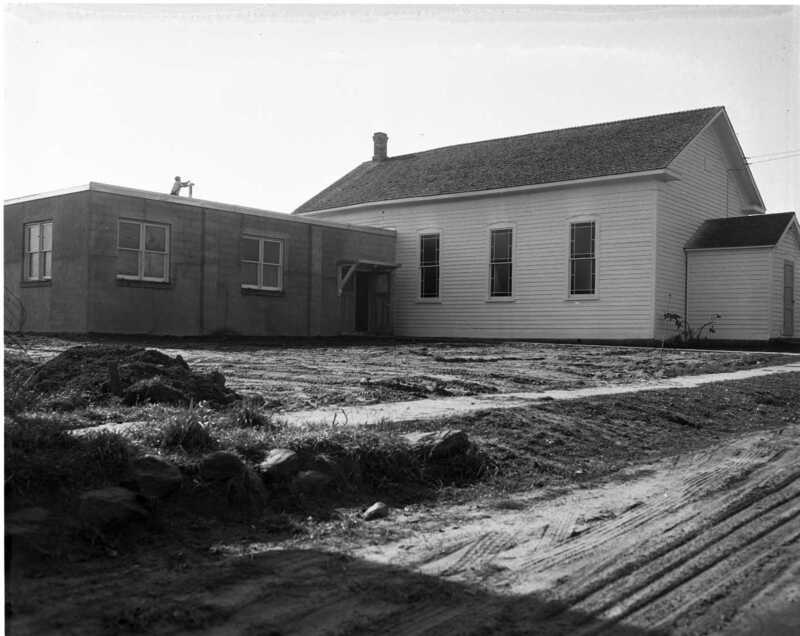 The old Central School that burnt a few years ago, was being built then, and Mabel Ruby also attended that school for a few years. The Manly Street School was a four room frame building on the site of the brick school built some years later and now occupied as a dress firm. 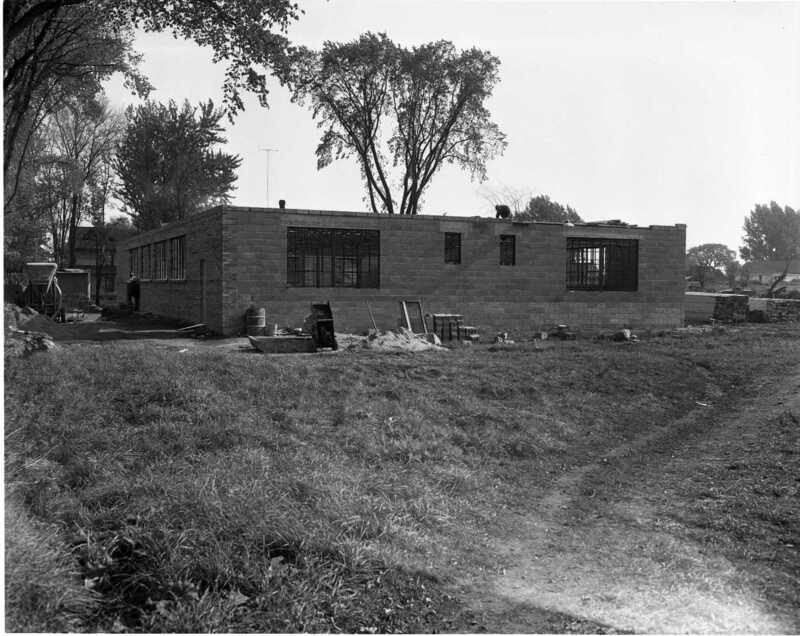 [Glen Mohr Frocks then Fabulous Formals and now a private residence] The Baptist Church was right next to the school. The principal at Manly Street was Tom Truman, who also taught at Central. Midland was pretty much a lumber town in Mabel Ruby’s younger days. Most of the buildings and what sidewalks there were had been built of wood. 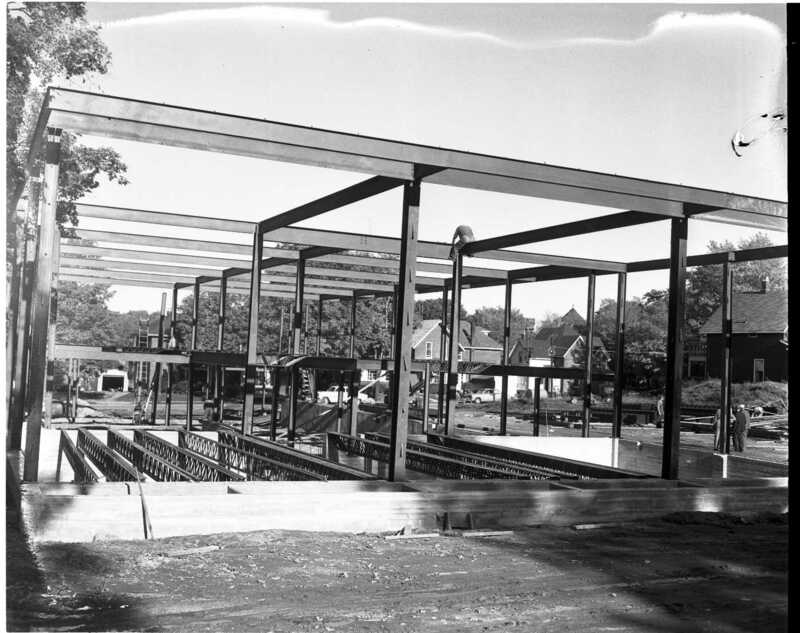 The area around her home on Midland Ave. was one of the busiest in town, with her father’s bake shop on one side and a grist mill and a woolen mill just across the street. In addition to his bake shop , where he sold huge loaves at 10 cents each, Mr. Ruby also had an ice cream parlour and china shop in the downtown section at the north end of King Street. Crawford’s Men Shop is located on the same site at present. There was only one flavour, vanilla, which Mrs. Ruby made in her own home. Nearly all of Midland’s stores back in Mrs. Jelly’s childhood were located in the two blocks between Hugel Ave and Bay Street. There was one hotel she remembers away up at the corner of King and Yonge. 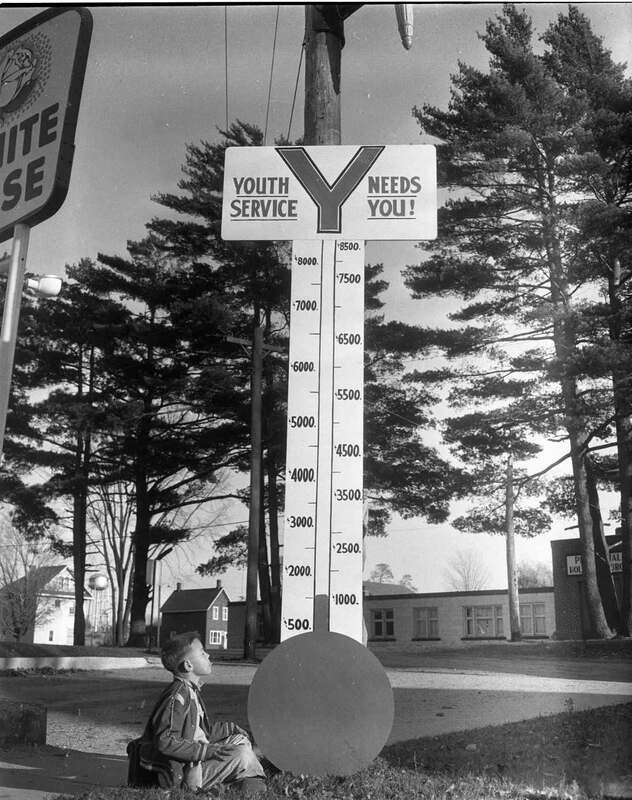 The young people of that day often passed the old hotel, especially to go swimming on a hot summer afternoon after Sunday School. Little Lake, then as now, was a popular spot with the younger set, although getting to it was a different matter than it is now. There was just a trail in from the south end of King Street, with several stiles to climb and a marshy path to thread. The area around the lake was not cleared for some years after it was given to the town by Squire Fraser. Midland YMCA’s Camp Kitchikewana received one of only eight citations awarded in the British Commonwealth this year from the Royal Life Saving Society in London for promoting and furthering the aims of the society. The citation was signed by Admiral the Earl of Mountbatten of Burma, K.G., P.C., G.C.S.I., G.C.I.E., G.C.V.O., K.C.B., D.S.O. Chris Gardner, Midland’s man of mystery, this year celebrates his 52nd year in magic, 32 of them in Midland. Penetang taxi operators announce a fare increase commencing November 1st. Town trips .50 cents, one stop, .10 cents for additional stops.